This is the eighth post in my series, Millennials Paving The Way, highlighting today's brightest Millennials who are empowering future generations to become change makers. In recent elections, Baby Boomers and prior generations have cast the majority of the votes. But the ranks of eligible Millennial voters have been growing, and are now on par with Boomers. I recently partnered with Millennial Mix and Paradigm Sample to provide data insights into one of the largest voting blocs in the U.S. - Millennials. 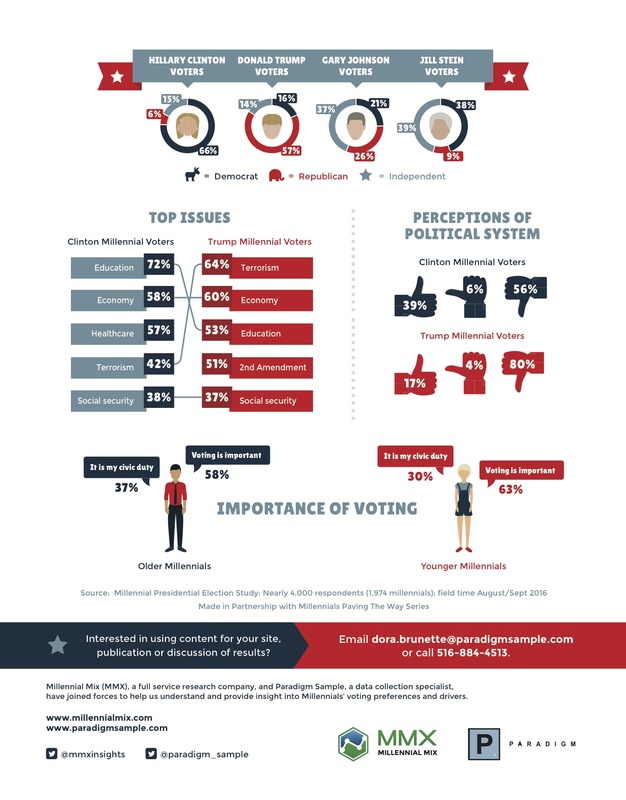 The survey conducted August-September 2016 among eligible Millennial voters, provides a unique perspective on voters' feelings about the presidential candidates. A majority of voters from both camps have a negative perception of our political system. Nearly six-in-ten Clinton supporters (58%) and a staggering 80% of Trump supporters offer a concern about our political system. Overall, Millennial voters overwhelmingly say Hillary Clinton is the best choice for the 45th President of the United States over Trump (36% vs. 24%). Clinton also holds a wide advantage over Trump when it comes to older Millennials (those born between 1980-1988) - 40% of voters say Clinton would do a better job compared with fewer (24%) who say Trump would do better. By a 30%-23% margin, Clinton holds an edge over Trump as the candidate of choice among younger Millennials (those born between 1989-1997). Millennial voters who support Clinton and Trump offer a variety of reasons why they do so, ranging from the candidate's position on education to the economy to fighting terrorism. Among Clinton supporters, education is the top voting issue (72%). Other issues that rank highly on voters' 2016 importance list among Clinton supporters include healthcare (57%) and terrorism (42%). 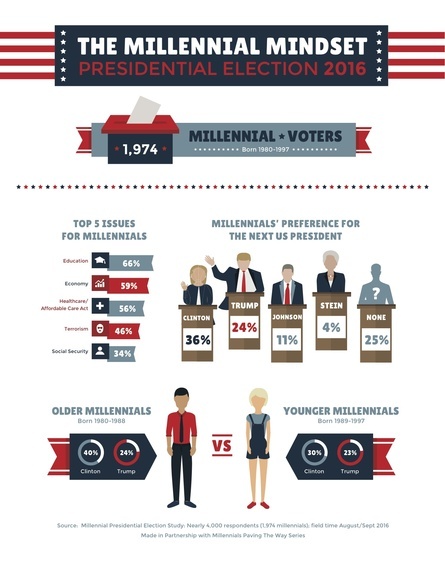 "According to our research, Clinton has a strong foothold with Millennials over the other candidate. The key factor will be to continue to motivate millennials over the upcoming days and get them to go vote on election day," says Sima Vasa, Advisor to Millennial Mix and Chief Evangelist Officer at Paradigm Sample. If you haven't already, register to vote using this quick and easy online voter registration tool and don't forget to vote! Author's Note: This series will cover the online habits of Millennials, their spending power, impact on the Fourth Industrial Revolution, role in achieving gender parity and much more.